rivalry between Louisiana and Kentucky. Although there were four horses from four southern states, the Louisiana and Kentucky horses were on the lips and the tips of the pens of writers throughout the U.S. The Louisiana-bred entry was Lecomte, from the stable of Thomas J. Wells, owner of a plantation near Alexandria. Representing Kentucky was a horse name Lexington. A match race in those days was a grueling test of speed and endurance in four-mile heats, with the winner being the horse with the best time in the three runnings. On this day, the track was muddy, and Lexington’s victory was considered by many a freak. A rematch was demanded. This time Lecomte was not only the winner but won in record time. Again there were calls for a rematch. On April 14, 1855, Tom Wells, owner of Lecomte, challenged Lexington in a head-to-head “rubber” match, with the winner being awarded $20,000. 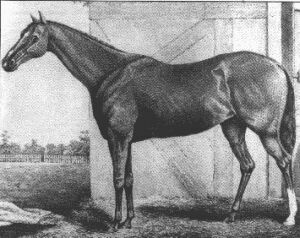 The race of April 14, 1855, was the last for both horses. They both gave great enjoyment to many when they competed. Even though it is more than 140 years since their last race, they are both still remembered. Lexington’s skeleton can be seen today properly mounted in the Smithsonian Institute, Washington, D.C. Lecomte is remembered through a town located south of Alexandria that was named in his honor, even though the name was misspelled – LECOMPTE. so handed Lexington his only career defeat. famous rivalries in American Turf history. Broeck and sent to England to race where he died of colic the following year.